FAG Bearings-6202-2RSR-C3 DEEP GROOVE BALL BEARING. INTERNAL RADIAL CLEARANCE DESIGNATIONS CONFORMING TO AFBMA STANDARDS, SECTION NO. 3. Radial internal clearance larger than CN (normal). Without seals to allow for the free circulation of either oil or grease, used in gearboxes and other assemblies where a lubricant is already present. With metal shields inserted into the outer raceway, these fit in closely to the inner race providing moderate protection against mechanical damage, and against the ingress of moisture, dust and other foreign objects. 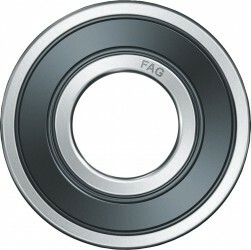 The shields also retain the pre-filled grease in the bearing. Shields can be easily removed for applications that only require one shield. With rubber seals inserted into the outer raceway and in contact with the inner race providing protection against the ingress of moisture, dust and other foreign objects. The seals also retain the pre-filled grease in the bearing. Seals can be easily removed for applications that only require one seal.